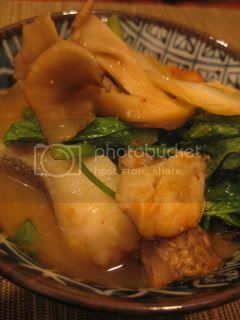 With my homemade kimchi, I was looking forward to make a hot pot dish. 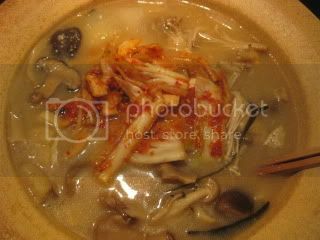 Kimchi and miso make good flavor combination, so I made Miso Kimchi Jjigae (Korean-style stew) with tons of my home-dried mushrooms and some leftover ingredients from the fridge. 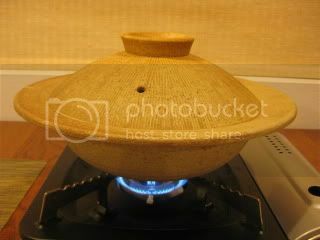 For this dish, I used Classic-style donabe, "Yu-Kizeto" (medium-size). 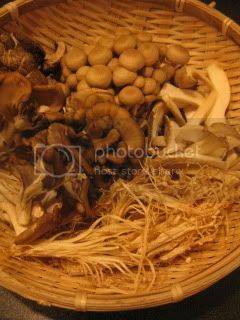 For the broth, I combined 3C water, a couple of dashi kombu (dry kelp) pieces (2" x 2"), and 1/3C sake with some sun-dried mushrooms and sliced abura-age. Since I had a couple of leftover pieces of donabe-smoked chicken drummets, I sliced off the meat and added the remaining bones to the water to enhance the broth flavors! Once the broth started simmering, I let it continue to simmer for about 5 minutes, then added 2.5T miso and 4 oz homemade kimchi and simmered further. 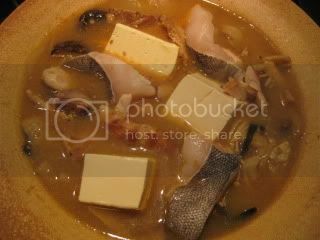 Chicken bones were removed and other ingredients - some tofu, meat from donabe-smoked chicken drummets and gindara (black cod) were added and simmered until everything was cooked through. 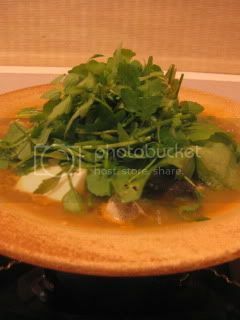 At the end, some chopped minari (dropwort) leaves were added, and the dish was ready. My homemade kimchi jjigae with leftover ingredients was fantastic! Wow...the broth was so deep and also the donabe smoked chicken added the extra depth in flavors. 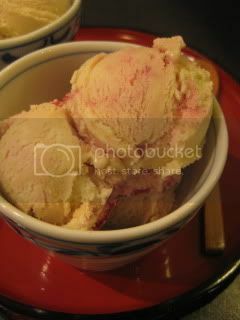 After the hot pot, my homemade rum vanilla & cranberry swirl ice cream it another spot.